Commencement of the Classes for 2014-2015 Batch Students of Aeronautical Engineering held on 01st August 2014. Lighting of Lamp by Students. EXCEL ENGINEERING COLLEGE, DEPARTMENT OF AERONAUTICAL ENGINEERING CONDUCTING GUEST LECTURE “PROCESS OF PROPULSION ENGINE DESIGN AND CFD MESHING “ ON 29/12/2018 IN AERO CAD LAB AT 10 AM BY MR.JAYAMURUGAN CHANDIRAN, PROJECT LEAD, HONEYWELL TECHNOLOGY SOLUTION, BANGALORE. EXCEL ENGINEERING COLLEGE, DEPARTMENT OF AERONAUTICAL ENGINEERING CONDUCTING GUEST LECTURE “ NON-DESTRUCTIVE TESTING “ON 28/12/2018 IN PAVAAYAMMAL HALL (A/C) AT 10 AM BY JAYASEELAN MADHIALAGAN, HAASEE INSPECTION ENGINEER, COIMBATORE. EXCEL ENGINEERING COLLEGE, DEPARTMENT OF AERONAUTICAL ENGINEERING CONDUCTING “DEFENCE TRAINNING PROGRAM “ON 28/12/2018 AND 29/12/2018 IN THIRUVALLUVARHALL (A/C) AT 09.00 AM TO 4.00PM BY DR.G.MANIKANDAN, EXCEL KARGIL AIR WARRIOR, EEC. Excel Engineering College-Dept of Aeronautical Engineering organized "Medical Healthcare Awareness Program" on 26th September 2018 by Dr.A.Ayyappan, Principal, Excel College of Physiotherapy & Research Centre at Excel Campus. Excel Engineering College-Dept of Aeronautical Engineering organized "Engineers Day" Celebration on 15th September 2018 at Excel Campus. Excel Engineering College-Dept of Aeronautical Engineering organized Guest Lecture on "aircraft structural analysis impact in industry" by Mr.Jaffer, Manager, Cube Technology, on 15th September 2018 at Excel Campus. EXCEL ENGINEERING COLLEGE-DEPARTMENT OF AERONAUTICAL ENGINEERING ORGANIZED GUEST LECTURE ON “TOTAL QUALITY MANAGEMENT” BY DR.THINANNEASHWARAN, EXCEL BUSINESS SCHOOL AND DR.VIMALNISHANTH EXCEL COLLEGE FOR COMMERCE AND SCIENCE ON 01/09/2018 (FN) AT CLASS ROOM NUMBER A3:202, EEC. Department of Aeronautical Engineering is conducted seminar on “Failure Analysis of Aircraft structural component” by CADD solution on 18/08/2018 at smart room, EEC. EXCEL ENGINEERING COLLEGE-DEPARTMENT OF AERONAUTICAL ENGINEERING ORGANIZED GUEST LECTURE ON “COMPUTATIONAL FLUID DYNAMICS” BY MARS ACADEMY ON 01/09/2018 (AN)AT PAVAIYAMMMAL HALL , EEC. EXCEL ENGINEERING COLLEGE-DEPARTMENT OF AERONAUTICAL ENGINEERING ORGANIZING THE “HEPATITIS B” AWARENESS PROGRAMON 21/07/2018 (FN) AT PALLAKAPALAYAM VILLAGE, NAMAKKAL. 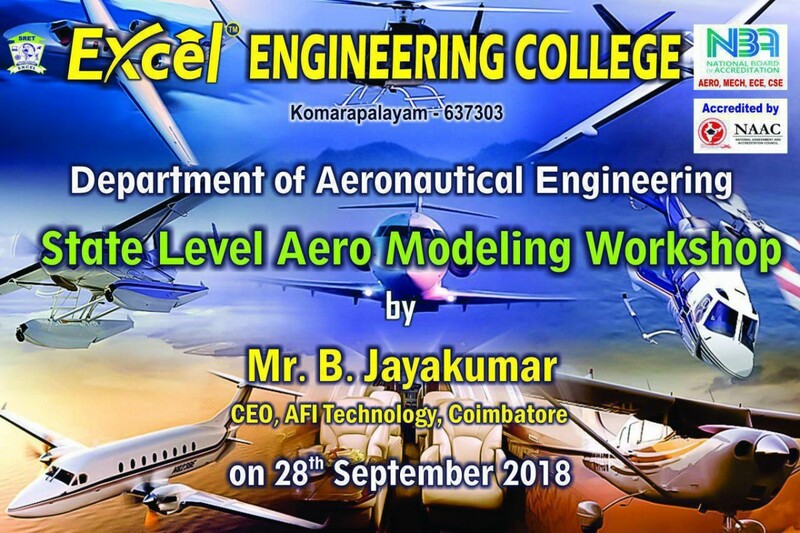 EXCEL ENGINEERING COLLEGE-DEPARTMENT OF AERONAUTICAL ENGINEERING ORGANIZING THE GUEST LECTURE ON “AERO ENGINES (INDUSTRY PRACTICE)”ON 20/07/2018 AT THIRUVALLUVAR HALL (A/C), EEC. Department of Aeronautical Engineering Organized an Awareness Program on "Excel Defence Academy-A new Milestone" on June 30 at Excel Campus. Department of Aeronautical Engineering has organized a seminar on career opportunities in aircraft technologies and emergence of 3D animation technology in engineering sector by Mr. Ravi Shanmugavel, operations Manager, AMSI technologies, Bangalore held on 23rd March 2018. A seminar on Design of Aircraft systems by Mr. Puvan.V, Technical Specialist Head, Research and Development, Spark, Erode held on 12th March 2018. Department of Aeronautical Engineering has organized a seminar on Gate Forum by Mr. Saravana Kumaran, Head gate forum, Coimbatore held on 27.02.2018. Department of Aeronautical Engineering has organized Industry Explorer'18 by Mr.D. Ravikumar, Head Global Resourcing, QUEST-Global, Bangalore held on 17th Feb 2018. A Guest lecture on Composite materials by Jc.K.V. Ramesh, Managing director, Go green Bio-Tech, Karur held on 3rd Feb 2018. A Guest lecture on Higher Studies by Mr. Srinivas Sambandam, Managing Director, Galaxy Educational Consultants held on 30th Jan 2018. A seminar on latest trends in aeronautical industry by Mr. Sundararajan.V, Head, Technology Excellence Group, Quest Global, Bengaluru held on 25th Jan 2018. An Airshow organized by Mr. J.Balakannan, CEO, Jet Aerospace & His team held on 10th Jan 2018 to 12th Jan 2018. A Leaders Talk on Aero Modeling by Mr.Tamizhagan, Junior Research Fellow, Madras Institute of Technology, Chennai held on 8th Nov 2017. An Engineers Day Celebration Conducted in the presence of Dr.P.Karunakaran, HoD/Department of Aero, Excel Engineering College held on 15th Sep 2017. 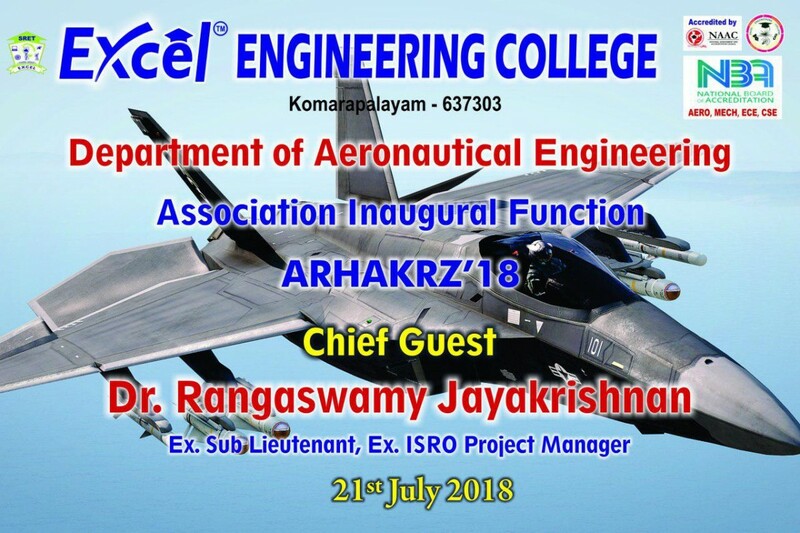 Excel Engineering College - Department of Aeronautical Engineering has organized Association Inauguration Function "ARHAKRZ" & Falcon Aero Club by Mr. K Sathiyamoorthy, Principal Scientist, Propulsion Division NAL, Bangalore held on 1st July 2017 at Pavaiyammal Hall. An Alumni Interaction on Latest Trends in Software Field conducted by Mr.Arjit Das, Baryons Software Solutions, Bengaluru held on 5th Aug 2017. An Alumni Interaction on Latest Trends in Software Field conducted by Mr.Saurav Puraksyatha, Esterline Technologies, Bengaluru held on 5th Aug 2017. Department of Aeronautical Engineering has organized Industry Explorer'17 by Mr. Sundararajan.V, Head, Technology Excellence Group, Quest Global, Bengaluru, Mr.S. Boopathy, General Manager, Accenture Services Limited, Bengaluru, Mr.J. Chandiran, Technology Specialist, Honey Well, Bengaluru held on 18th Feb 2017. A Seminar on Opportunities in Design and Development Industries by Mr.S.Boopathy, General Manager, Accenture Services Limited, Bengaluru held on 7th Jan 2017. A Seminar on recent trends in Aerospace Software’s Mr.J. Chandiran, Technology Specialist Honey Well, Bengaluru held on 18th Feb 2017. A Guest Lecturer on Aircraft Overhauling and Servicing Procedure Mr.A.Vivekananthan (Retd. ),Junior Warrant Officer, Indian Air force 15th October 2016. Sergeant, Indian Air Force held on 8th Oct 2016. A Quiz Competition on ENGINEERIA for Students by CADD Centre, Bhavani held on 3th Oct 2016. Coimbatore held on 24th Oct 2016. A Webinar on system Engineering by Dassault System Tech Talk Series held on 10th Aug 2016. A Webinar on Digital Manufacturing by Dassault System Tech Talk Series held on 17th Aug 2016. Excel Engineering College - Department of Aeronautical Engineering has organized Association Inauguration Function "ARHAKRZ’16" by Mr. K Sathiyamoorthy, Principal Scientist, Propulsion Division NAL, Bangalore held on 14th July 2016. A Seminar on Modern Communication System by Mr.L.Bharathi, ASP Department of ECE, Excel Engineering College held on 13th Jun 2016. A Guest Lecture on Navigation and Engine Instruments by Mr.A.Sabik Nainar (Retd. ), Sergeant, Indian Air Force on 11th March 2016. A Seminar on How to Become an Entrepreneur by Dr.Gurumoorthy, Professor, Dept of Management Studies, Excel Business School held on 27th Feb 2016. A Guest Lecture on Recent Trends in Manufacturing technology by Dr.M.Murugan, Associate Professor, Mechanical Engineering, Excel Engineering College held on 13th Feb 2016. A Guest Lecture on UAV and MAV Workshop Modelling by Mr.A.Karthikeyan, Associate Professor, Aeronautical Engineering Excel Engineering College held on 2nd Jan 2016. A Guest Lecture on Welding techniques by Dr.G.Nallakumarasamy, HOD, Mechanical Engineering , Excel Engineering College held on 19th Sep 2015. Excel Engineering College - Department of Aeronautical Engineering has organized 6th National Level Technical Symposium PATANGK’15 in the presence of Mr.G.Rajendran, Regional Director, DGAQA, HAL Hyderabad held on 5th Sep 2015. Department of Aeronautical organized GATE AWARENESS Program by Mr. N Gowri Shankar Centre Director, PRO Gate Coimbatore held on 22nd Aug 2015 at APJ Abdul Kalam Hall A/C, Excel Engineering College. A Seminar on application of High temperature and smart materials in Aviation Field by Dr.P. Karunakaran, Professor, Erode Senguthar Engineering College held on 8th Aug 2015. General Manager, Composite Manufacturing Division (Helicopter Complex), HAL Bengaluru held on 25th July 2015. A seminar on Stealth Technology and Hypersonic Vehicle Research by Rtn. Mr.Joe Ramos Past District Governor 2013-14, RID 5330, USA, Scientist (USA), NASA held on 30th March 2015. Department of Aeronautical Engineering has organized Industry Explorer'15 by Mr.ShasikanthJayaraman Head HR, TVS Automobile solutions, Ltd., Chennai, Mr.Sundararajan.V,Head, Technology Excellence Group, Quest Global Bengaluru, Mr.Senthil Nathan, General Manager, Ultra main Software India Pvt. Ltd., Coimbatore, Mr. Raj Kalyanarajan, Factory Manager, ACSD Operations, CAT INDIA, Hosur, Mr.V.P.Ponnusamy, Head HR, Reckitt Benckiser Scholl India limited, Chennai held on 14th Feb 2015. A Guest Lecturer on “Autopilot and Avionic System” by Er. Prabhu Deputy Manager, Helicopter Division, HAL, Bangalore held on 31st Jan 2015. A National Level Technical Symposium FTRAA’14 in the presence of Dr. P RajaGopal, NAL Bangalore held on 1st September 2014. Department Association Inaugurated by Er.Ongolu Germia DGM Helicopter Division, HAL Bangalore and Er. David John Scientist “C”, DRDO, Bangalore held on 26th July 2014. Natioal level Technical Symposium (NSRAA 13) on 08-10-2013. Association Inaugural function (ARHAKRZ & AEROSPACITA) & Seminar on “Design Challenges in Aeronautical field” On 06-08-2013. Recent Trends in Aeronautical and Aerospace Engineering (ARDB Sponsered) and Airforce Day Celebrations. Seminar on “ Research in Aeronautical Field”: CHIEF GUEST: Dr.S.Raja,Senior Principal Scientist, NAL, Bengaluru. A Seminar on “Industry Expectations from Freshers” of Department of Aeronautical Engineering and Mechanical Engineering held on 27.10.2012. 4th National Level Technical Symposium “GRIFFINS 12” - conducted at Department of Aeronautical Engineering held on 24.08.2012. “ARHAKRZ & HAWKEES - 12”, Association of Aeronautical Engineering held on 11.08.2012. CHIEF GUEST: Mr.S.Raja,Senior Chief Scientist,ISRO. CHIEF GUEST: Dr Raj C Thiagarajan,Managing Director,ATOA Scientific Technologies Pvt Ltd,Bengaluru. CSIR Sponsored National level Seminar on “Recent Trends in Aerospace propulsion” On 31-08-2013. EXCEL ENGINEERING COLLEGE, DEPARTMENT OF AERONAUTICAL ENGINEERING SECOND YEAR AND THIRD YEAR STUDENTS ARE VISITED “SOCIETY OF INDIAN AEROSPACE TECHNOLOGIES AND INDUSTRIES “HAL CONVENTION CENTRE ON 09/08/2018 TO 10/08/2018 AT BANGALORE. EXCEL ENGINEERING COLLEGE, DEPARTMENT OF AERONAUTICAL ENGINEERING FINAL YEAR STUDENTS ARE VISITED “AURORA NDT INSTITUTION “ON 25/07/2018 AT COIMBATORE. EXCEL ENGINEERING COLLEGE, DEPARTMENT OF AERONAUTICAL ENGINEERING FINAL YEAR STUDENTS ARE VISITED “MANIMEGALAI INDUSTRIES “ON 18/07/2018 AT COIMBATORE. Department of Aeronautical Engineering second year students are visited “Bhavanisager hydroelectric power plant “on 20/08/2018 at Bhavanisagar.